Compact Travel Tea Set comes with a traditional gaiwan, pouring pitcher, 4 to 6 cups and metal pincer. All elegantly placed in a hand held travel pouch. Easy to carry along with a picnic or to create a mini tea break. 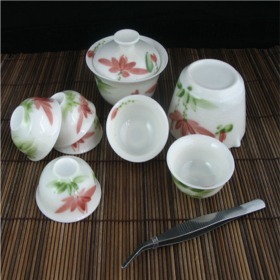 4-6 small tea cups (Width = 4.5 cm, Height = 2.7 cm), gaiwan (Width = 7 cm, Height = 6 cm), tea pitcher (Width = 7.3 cm, Height = 6.3 cm). Everything comes in a compact small rectangular brownish bag. In the Chinese tradition of gong fu cha, chinese tea is placed in the gaiwan for steeping. The lid of chinese gaiwan is used to sieve the leaves away from the pouring or drinking edge. Then the brewed chinese tea is poured into the sharing pitcher, which is used to insure that each cup tastes exactly the same. Enjoy! Colors of actual product may vary slightly from images shown. Designs are assorted and might not be the same as pictured. Please take note.